The beautiful Platinum Ridge 8 villa is designed to provide the ultimate vacation experience. With wrap-around terraces and an expansive living-dining-kitchen area that opens directly onto the pool terrace, this villa is perfect for guests who prefer a truly luxury villa. Each villa is also designed to meet the dual requirements as a luxury vacation residence and successful luxury villa rental property. 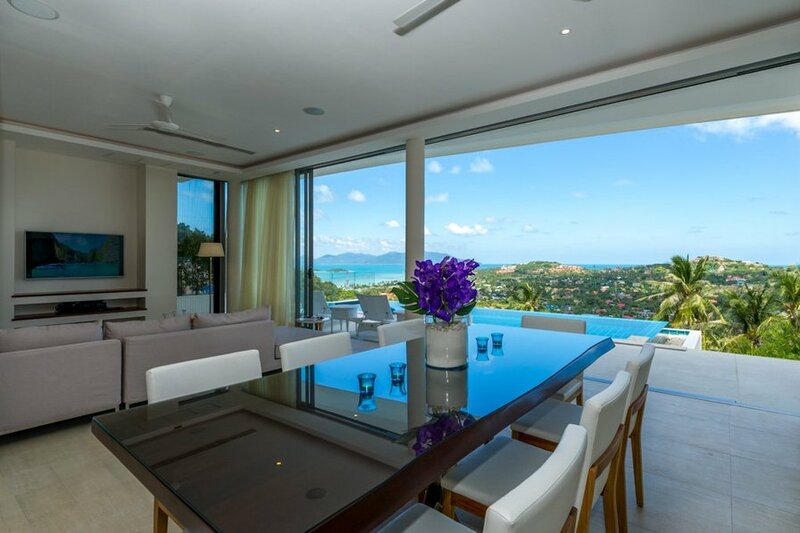 The Ridge is an exclusive luxury development of private pool villas with panoramic sea views located in the prime North East of Koh Samui, just minutes from the island’s most popular beaches and entertainment areas. Spacious bedrooms offer spectacular panoramic views and huge floor-to-ceiling windows on both living and bedroom levels. The Ridge offers a panoramic sea view over looking Plai Temple and Big Buddha beach. Please be aware that the area is being constructed at the moment so there will be occasional disturbances. Due to this, we are currently offering a discounted rate for the inconvenience of construction. The villa features a fully-equipped western style kitchen, ensuite bathroom for all rooms, safety box, cable TV, wifi, and a spacious living area. It also features a self-contained studio unit on the ground floor with its lounge, kitchen, and ensuite bathroom. Perfect for members of the guests who want extra privacy. The villa has a gorgeous infinity pool with sun lounges and outdoor seating perfect for relaxation. > A complimentary airport pick-up for check-in (one-way only).